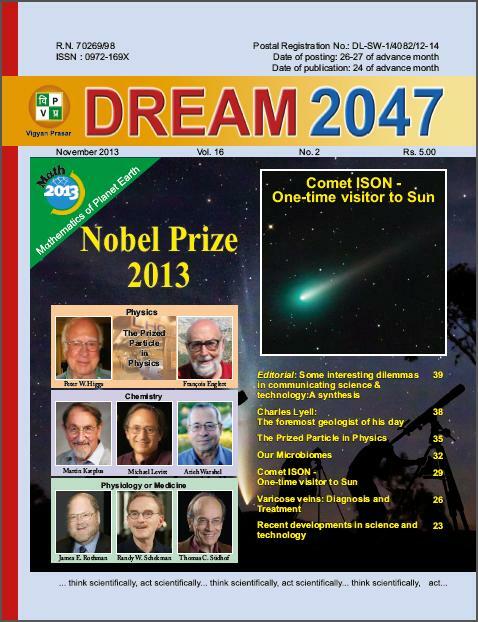 Dream 2047 is monthly popular science magazine published by Vigyan Prasar, an autonomous institution under Department of Science and Technology, Government of India. The magazine has over fifty thousand subscribers. It is sent free to schools, colleges and individuals interested in science and technology communication. Vigyan Prasar fulfils this objective through strategically important tasks based on in – house thematic and communication expertise and institutional collaborations / synergies. Accordingly, Vigyan Prasar delivers appropriate information relevant for stakeholder groups across the country and in response to felt needs.